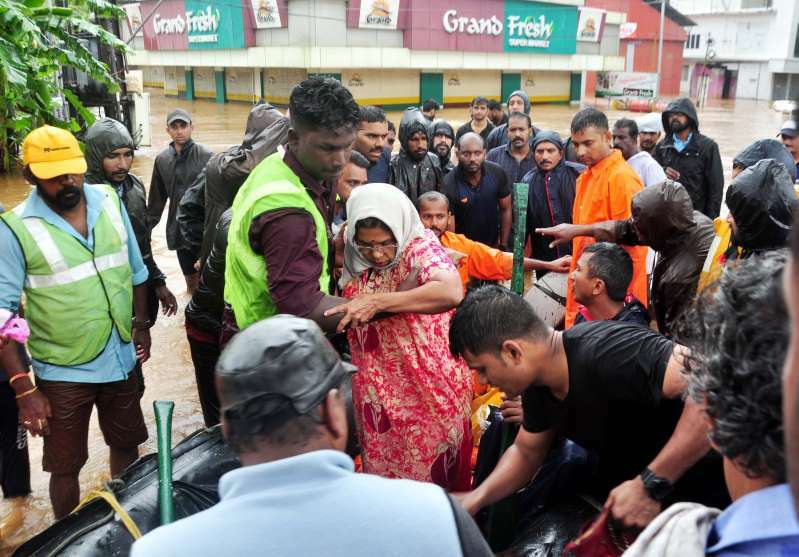 Pressure intensified Saturday to save thousands still trapped by devastating floods that have killed more than 300 in the Indian state of Kerala, triggering landslides and sending torrents sweeping through villages in the region's worst inundation crisis in a century. The state is "facing the worst floods in 100 years", chief minister Pinarayi Vijayan said on Twitter, adding that at least 324 lives have been lost so far. India's Prime Minister Narendra Modi arrived in the stricken state on Friday night, Vijayan's office tweeted, with media reports saying the premier would undertake an aerial survey of the worst-affected areas on Saturday. [post_ads]People all over the state of 33 million have made panicked appeals on social media for help, saying they cannot make contact with rescue services as power and communication lines are down. "My family and neighbouring families are in trouble," wrote Ajo Varghese, a resident of the coastal city of Alappuzha, in a Facebook post that quickly went viral. "No water and food. Not able to communicate from afternoon. Mobile phones are not reachable... Please help," he added. "We are deploying more boats and the army to ramp up rescue operations," senior state government official P.H. Kurian told AFP. According to India's weather bureau, since the beginning of June more than 321 centimetres (126 inches) of rain has fallen on the hilly central district of Idukki, which is now virtually cut off from the rest of the state. The Kerala government has said it faces an "extremely grave" crisis and Vijayan warned of further torrential rainfall hitting the region over the weekend.